Designer James Dimech thought “big, flowing and glamourous” when he conceived a dress out of the pages of Pink magazine for the opening of The Pink Fashion Show. He spent many a sleepless night cutting, pleating, sticking, sewing and gluing everything by hand – driven by a firm belief in sustainable fashion and in what can be done with simple resources when creativity is involved. What were your thoughts when Pink approached you to design a dress out of the pages of the magazine for its 5th anniversary fashion show? Did you immediately agree? Or did you have reservations about the whole thing? Well, when I was approached with the idea, I was still recovering the energy I had invested in creating my White Paper Star collection. Being self-employed, I had a bit of a backlog with my interior design works. However, I was thrilled and immediately said yes, without any second thoughts… But that is me after all. Being offered to showcase my passion for paper fashion is an opportunity I could never miss. Once you decided to go for it, did you know exactly what you wanted to create, or was it a fluid process that took shape with time? The only thing I had in mind was BIG! I thought that since it was going to be just one garment, it needed to be big – but big as in wow – something to remember. What did you want to achieve in this dress – the look, the feel, the statement? And what was your inspiration? Working on my previous collection helped a lot. I gained experience on paper-folding techniques and the mounting of the same in a wearable way. However, I never like to repeat myself in my work, so for the Pink dress, I wanted to go to another level. Although I had a very good idea of the style of dress, it took me a while to sort out the best folding technique to use. 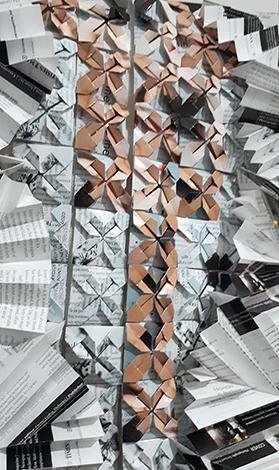 I opted for different forms of origami, blended together on one piece to create a statement. From the brief I was given, I knew a model was going to open The Pink Fashion Show wearing the paper dress, so the same three words kept coming up – big, flowing, glamorous. That had to be my final goal. What was the hardest and most stressful part of the creation? This may sound strange, but the day I was given a bunch of old issues of Pink to work with was the most stressful. Before then, I was planning to use mostly pages with black and white text and the colourful printed pages as trimmings, but I did not realise that Pink is based more on beautiful editorials with great photo shoots, rather than long boring articles. So, I had to rethink the whole concept, moving away from the idea of black and white. I guess that was pretty stressful as it took me days flipping through pages, sorting out from where I could do my origami. It’s not the first time you’ve worked with paper. This is what you do. But what was different for the Pink dress? I’ve worked with a vast variety of paper used for printing. But Pink is printed on fine coated paper and it was the first time I used this. Let’s say it’s less foldable than thicker non-coated paper. This meant I discarded some of the origami ideas I had in mind and opted for something different. And that was the second stressful part of the venture. I needed to act fast as time was pressing. From 300 magazines, I selected pages by colour – back and front – and by images picturing mainly faces. Some were used for paper tessellation, mounted on the bodice [for the glamorous part], and others – lots of others – were used for a layered long tail [the flowing part]. As for the big part, I shredded a bunch of black/white and red printed pages. 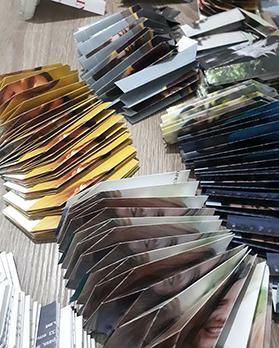 By then, I had it all sorted in my mind but never realised I would need to fold that much… until almost the last minute, in fact. Can you sum it up in numbers? Hours of work? Sleepless nights? Help from family members? Pages? Magazines? Folds? For the tail, the craziest challenge, I used 12 rows of double reverse pleats made out from 600 cut-outs measuring 14 x 14cm, layered with a 1cm overlap to create movement. These were fixed by hand with stitching and hot glue. It was a long and fluid process that was likely to change during the actual mounting. 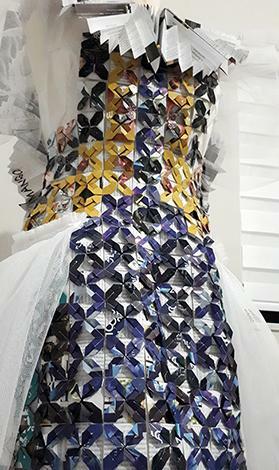 The short A-line dress is covered with 300 origami pieces made from 7 x 7cm cut-outs folded into 3 x 3cm, with a selection of dominant colours like blues and yellows creating a base tessellation. This amounted to around 100 of the last two issues of Pink. From a selection of black and white strips cut from the editorial page, 48 pieces of triangular folds created a collar falling on the back. The problem with these garments is that you can never calculate how many folded papers you will be using in the end, so I used some help from my sister and a very close friend to have some pre-folds done in advance. But since the pattern kept evolving during the actual mounting, I kept running out of folds until almost the last minute. I cannot really sum up the number of hours I spent on this because, together with the Pink dress, I was working on another interesting project and all this happened after working hours – the only way to keep up with things and not disappoint my clients. I can say that for the past two months, I was lucky to sleep for four hours a night. How was it dressing digital influencer Sarah Zerafa? Sarah is a natural-born fashionista. She carries anything she wears in a special way. I was impressed when, together with photographer Kurt Paris, we did the shoot for the invitations to The Pink Fashion Show. At the time, the dress was not yet ready, so we shot close-ups of the upper body and was I pretty nervous about it. But when Sarah put on the dress and started posing in front of the camera, I was amazed at the result. That day, I got the boost I was waiting for and it gave me the strength to finish off the dress in the best way possible. Did you have fears on the day of the show about how it would all work out and go down with the audience? The dress is delicate so that must have added to the nerves, right? My main concern with paper dresses is always the handling; safe delivery to the venue amounts to a lot of pressure. Once that mission was accomplished, the second main concern was to keep the dress safe backstage and to avoid any last-minute unfortunate accidents [like someone stepping on the tail]. Then, my greatest fear was whether the tail would move as planned. What if it got stuck? So many questions… I kept my fingers crossed that none of that would happen. The only thing I honestly did not think about was the reaction of the audience. This turned out to be a good thing because, afterwards, I was overwhelmed with the positive feedback. Only then did I say to myself: it was worth the effort. Hard work pays. How would you describe your participation in The Pink Fashion Show and the overall experience? I admit I did not have any particular expectations when I decided to participate, apart from showcasing a new work this time as part of a theme chosen for the 5th anniversary of the show. But I must say I don’t regret one bit of it. Working with people who put so much heart into organising and coordinating such an event is stimulating. 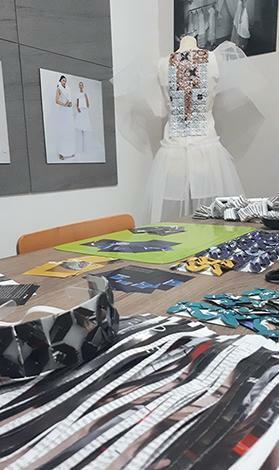 Being approached by people after the fashion show to congratulate me and ask me what’s next, eager to see more of my paper fashion, gave me great satisfaction. And then, the following day, I had the most unexpected surprise, seeing my dress published on the front page of Times of Malta. Together with all the positive feedback on social media, that was the cherry on the cake, so thank you, Pink, for believing in me. Eco-friendliness is a major part of what you do, and recycling is the name of the game. Do you think these concepts are not yet appreciated and taken on board enough by others in Malta? I’ve been following and studying eco and sustainable fashion for the past three years now. I participate in forums on the web with people from all over the world to keep updated on the matter as much as possible and, yes, I think we are far behind here. We made a big improvement and created awareness on the importance of separating our rubbish, but only a few of us are aware of what is happening with the trash we are recycling. Eco-fashion is the future in this industry, and even if it will take some time to be acknowledged here in Malta, I’m positive more and more people will start appreciating it. The key is more information on what is coming out of our household bins filled with recyclable waste. While it is the height of creativity and good to design a dress out of recycled material, what does it feel like to know that the end result is so delicate, possibly not wearable in the everyday sense of the word and, therefore, after all that workmanship, something that is likely not to last? Do you ever wonder why you invest so much time in this? I am conscious that a dress made out of raw recyclable materials is not something you can wear for an evening out, or a special occasion, but I see it as a piece of art. Having said that, it doesn’t mean I don’t feel bad when I have to dismantle a garment from a mannequin to make space for a new one. On the other hand, having my work published on magazines and on the net is the best way to keep them alive. Looking back at the photos and seeing the number of people from all over the world who liked them and commented on social media about their favourite dress gives me great satisfaction. The news is that my paper pieces are only the start of a journey and my search for sustainable fashion keeps on evolving. 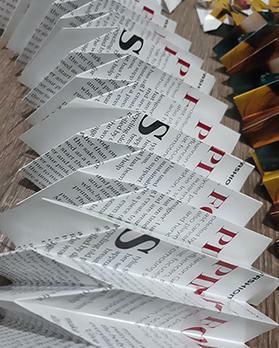 Very soon, I will be launching the next step after the paper dress. And this time, it is very wearable. By day, people will often find you feeding horses at the Kitchen Garden in Attard. How do these two very different worlds of yours marry… or collide? My day job is interior design and I’m pretty busy with that actually. But yes, I do have a twice daily commitment at The President’s Kitchen Garden. My passion for animals requires some sacrifice as I have to plan my day around them, but I thank God I have managed it for the past 10 years and hope to keep on doing it because, together with my animals, we give joy to kids and, for me, that is as rewarding as creating a paper dress. It’s going to be my year. That is how I’m referring to 2019. It’s not going to be easy, but I’m working hard to make it happen. It will be about the evolution of my sustainable fashion to the next level. Wish me luck!